I bake other things too, and on Sunday I had a go at my second batch of chocolate eclairs. They were pretty yummy, but I need a better recipe for my non-fan-forced oven. 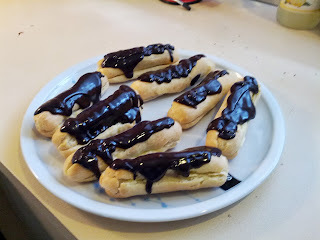 Choux pastry rolls with creme patisserie filling (vanilla with a hint of cinnamon because reason I can't recall and I'll leave it out next time) and 70% chocolate ganache (with a hint of golden syrup so it wasn't too bitter). Yum.